The FDA's warning letter to General Mills this week concerning its unsubstantiated label claims about Cheerios and cholesterol came as a pleasant surprise to me, as well as a sign of what more is to come. Since the neighborhood Safeway supermarket is practically my second office, I certainly know my way around a label or two. Registered dietitians like me are often the ones who reach out to food manufacturers and tell them something appears wrong on a label—not, usually, the government. Under previous administrations, food companies have been able to make plenty of health claims with only, say, one small clinical trial for substantiation. Cheerios, one of General Mills' flagship brands, was probably the first of many large food brands that will be getting warnings about their often outrageous on-package health claims—in this case, that the cereal can help you lower your cholesterol by 4% in six weeks. Cheerios is made with whole grains, yes, and I do believe that eating them daily will probably lower your cholesterol—but probably only if you were previously eating croissants, Dunkin' Donuts, or McDonald's every morning instead. If you are already eating a healthy whole-grain cereal every day, switching to Cheerios is likely to do nothing for your lipid levels. Based on claims made on your product's label, we have determined that your Cheerios Toasted Whole Grain Oat Cereal is promoted for conditions that cause it to be a drug because the product is intended for use in the prevention, mitigation, and treatment of disease. The FDA continued that any claim intended for use in "the prevention, mitigation, and treatment of disease" should file for an FDA-approved drug claim. 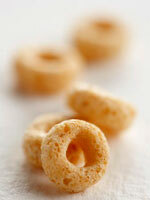 Of course, I doubt that Cheerios would pass the rigorous scientific scrutiny of a full-blown drug claim. I expect General Mills will soften its language to reflect something closer to the FDA-approved whole-grain claim, which isn't so specific on the magnitude of the cholesterol-lowering benefit you may experience. The rules of food labeling and regulation are rapidly changing, thanks to a president and first lady with a passion for good nutrition—and common sense—in the White House. I expect more and more major brands to get similar letters in the upcoming months. Who will be next? Will the Kellogg's Special K Challenge be no more? Let's keep an eye out to see who gets the next warning letter or, better yet, tell us some of the most outlandish claims you’ve seen on food labels.